Dr. Claire Lodahl graduated in 1980 from the New York State College of Veterinary Medicine at Cornell University in Ithaca, New York. 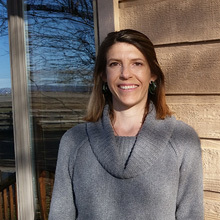 Her extensive experience in practice includes working in both small animal and mixed practices in Upstate New York, Idaho, Alaska , Colorado, and New Mexico. Some of her more unusual experiences included working on Iditarod sled dog teams in Alaska, consulting on alternative therapies for horses in Ireland, and speaking on her experience with alternative therapies at international conferences. She especially enjoys working with a wide variety of animals, and has experience which includes cats, dogs, and exotics, llamas and alpacas, small ruminants, horses, emus, buffalo and African lions and elephants. 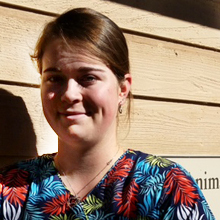 In the Durango area, she worked in both Cortez and Farmington in mixed practices before deciding to start her own practice here at Kindness Animal Hospital, which has been open since January1st, 2007. Starting as a mixed practice for all animals, the practice is now focused primarily on small animals. Dr. Nichole Ramey recently graduated from the University of Wisconsin-Madison School of Veterinary Medicine. She enjoys working with all animals and has a special interest in exotics, such as reptiles, birds, fish and small mammals. She is also specifically interested in alternative medicine and nutrition. 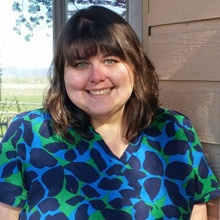 While earning her DVM, she participated in UW’s Master of Public Health program and attended acupuncture classes at the Chi Institute in Florida. A few of her highlight experiences while in vet school include working at Valley of the Kings lion & tiger sanctuary, assisting with conservation efforts at the Georgia Sea Turtle Center, and doing shark research with the Oklahoma Aquarium. 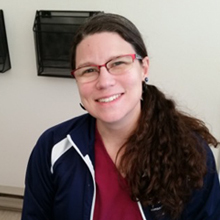 Dr. Ramey earned her undergraduate psychology degree at Fort Lewis College, and is very excited to have the opportunity to start off her career as a doctor here at Kindness Animal Hospital! 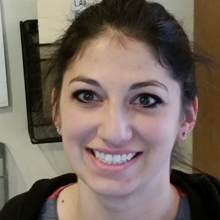 Danielle Jaramillo is both a receptionist and veterinary assistant. She has lived in the Durango area for 20 years. She enjoys all types of animals, and especially likes going camping with her dogs. Kirby Brown performs the role of Veterinary Technician. She just graduated form the University of Colorado at Boulder, with a degree in Integrative Physiology. She hopes to go on to Veterinary School in the near future. In her free time, Kirby likes to adventure on long hikes, play with her pets, and spend time with her family. Annie Anderson is a lifetime lover of animals, both large and small. She holds a Bachelor of Science in Equestrian Careers and Industry Management. She has worked as a veterinary technician since 2001, for six years as an veterinary emergency room technician and for four years as an veterinary oncology technician. Horse training and dog training have also been life long passions. She is ready to help any animal, furry, scaly, feathery, or hooved! 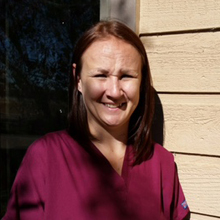 Christina Dillon is both a receptionist and veterinary assistant. She recently moved to Durango from Las Vegas, Nevada. She worked for 6 years for a large multi-doctor practice in Las Vegas as a receptionist. She has 2 cats, “Steven Tyler” and “Nala,” and in her free time she likes hiking, fishing, reading and antique shopping. Aisha Groose is our newest staff member. She is currently in school studying to become a licensed Veterinary Technician, and is doing her practical course work with us. Aisha moved to Durango 3 years ago from Wyoming. She has a dog named “Chloe” and two cats named “Aspen” and “Salem.” She likes to go hiking on the weekends with her dog.